Raising the bar (literally) for lift assist carriers, the Hullavator lifts a kayak up to 35kgs and allows for side of vehicle loading. 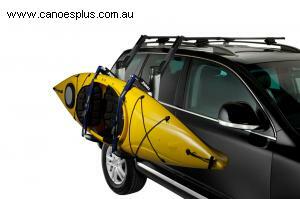 Gas-assist struts lift and lower a kayak up to 35kg's allowing only one person to load and unload the kayak. Load and unload kayaks are waist level, at the side of the vehicle for greater convenience and safety. Double extending arms lower the kayak by up to 100cm for faster loading and unloading. Aluminum, double coated steel construction for corrosion resistance deliver a longer product life. Up to 2 carriers per vehicle (bar width minimum of 135cm, 862 aero or 762 square). Accommodates kayaks up to 85cm wide and 35kg's.